The Historic Racing Drivers Club has expanded its race calendar to six race events for 2012, featuring five race series, all of which are registered with the MSA. The confirmed calendar offers a great balance between 'mighty' circuits, offering large grids with great driver commitment such as Castle Combe, Snetterton 300, Spa and Donington; and historical 'gems', in the form of the smaller, but no less demanding, Lydden Hill and Mallory Park tracks. 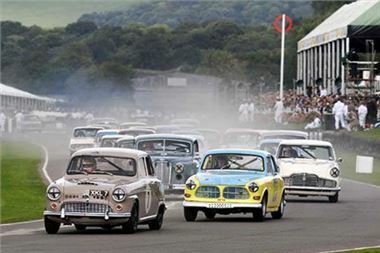 After a sensational inaugural season in 2011, current feedback from driver registrations suggests that HRDC grids will be enthusiastically supported in 2012. HRDC Founder and Race Director, Julius Thurgood, comments: "The HRDC showed this season that there is a high demand for 'no frills', well-run historic races at club level. The entertainment value from well-supported grids, sporting a great variety of superbly presented cars, certainly went down a storm with both drivers and spectators at all the venues we visited. I am certain that the HRDC can deliver an even better spectacle and great variety for drivers and historic race fans in 2012." :: TYRES: Dunlop CR65 'L'-section in 204 compound. :: RACE FORMAT: 45-minutes, optional 1 or 2-driver race with compulsory pit-stop between 15 - 30 minutes. :: CLASSES: A: Over 2701cc; B: 1601cc-2700cc; C: 1201cc-1600cc; D: Up to 1200cc; S: 1300cc; XK: Jaguar XKs up to 3800cc. :: RACES IN 2012: Castle Combe, Snetterton, Spa, Donington Park, Lydden Hill, Mallory Park. :: RACE FORMAT: 30-minutes, single-driver race. :: CLASSES: INT A: 1001cc-1500cc; INT B: up to 1000cc; NAT A: 1001cc-1500cc; NAT B: up to 1000cc. HRDC 'TC63' CATEGORY: For early, pre-'64 historic touring cars complying with Appendix 'J' Group 2 of the International Sporting Code. :: CLASSES: Class 1: 0-600 cc; Class 2: 601-700cc; Class 3: 701-850cc; Class 4: 851-1000cc; Class 5: 1001-1300cc; Class 6: 1301-1600cc; Class 7: 1601-2000cc; Class 8: 2001-2500cc; Class 9: over 2500cc. HRDC 'MGB50' CATEGORY: For pre-'66 historic MGB cars complying with Appendix 'K' of the International Sporting Code. ::TYRES: Dunlop CR65 'L'-section in 204 compound. :: RACE FORMAT: 30-minutes, single driver race. :: CLASSES: INT B: FIA MGB; INT B: MGB cars of historical importance not complying with FIA Appendix 'K'. HRDC 'GTS65' CATEGORY: For pre-'66 historic GT cars, over 1500cc, complying with Appendix 'K' to the International Sporting Code. :: CLASSES: Class A: Over 2701cc; Class B: 2001 to 2700cc; Class C: 1651 to 2000cc; Class D: 1501 to 1650cc. :: RACES IN 2012: Castle Combe, Donington Park, Mallory Park.